The Museum of Ontario Archaeology is a great birthday party place for kids! We are excited to offer the programming and space to make your child’s birthday a unique and?memorable?one. 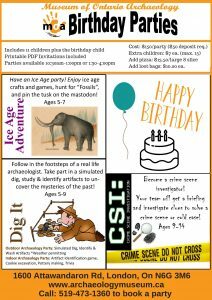 Museum animators bring to life four fun themes: Ice Age Adventure, CSI (Crime Scene Investigation), Creative Minds, and Dig It! ?Ice Age Adventure?– (ages 5-7)?Pin the tusk on the Mastodon, Ice?Bingo, and hunt for “fossils” to reassemble! 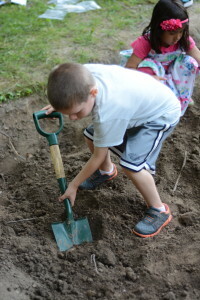 Dig It ?– (5+) Follow in the footsteps of a real-life archaeologist. Take part in a simulated dig, and study & identify artifacts to uncover the mysteries of the past. CSI: Crime Scene Investigation – (ages 9-14) Become a crime scene investigator! Your team will get a briefing and investigate clues to solve a crime or cold case. There’s nothing easier than scheduling a birthday party for your child and his or her friends at MOA. We take care of the?details?so you can enjoy the day! 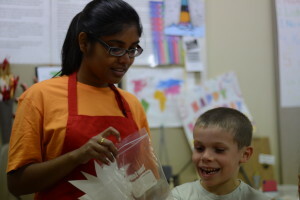 We offer both?indoor and outdoor activities that are fun and educational for kids from ages 5 – 14.